in this picture you see a samsung Np680z5e laptop. it has a broken lcd cover. now Im not sure how it happened, probably by accident. its really none of my business. my business is to fix it and do it quickly and usually at some affordable rate. unfortunately sometimes that is not possible. as in this case of samsung np680z5e laptop which has a broken lcd cover – that is the part behind the lcd screen or if you look at the closed laptop – it is the top part that is looking back at you. 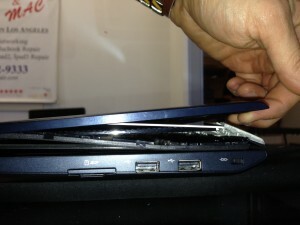 on most of the laptops even on macbooks it is replaceable part. lcd cover holds the lcd inside and if it breaks you just order it and replace it. sounds and is usually a pretty easy job. not in this case. And I dont necessarily want to say that samsung is the one doing this. in this case they are. Overall though, most of the newer laptops – especially the ones with touchscreen digitizers from hp and dell are not being sold as separate parts anymore. they sell lcd screens as the whole unit and it is very hard to find replacement part for lcd cover only. however that being said if you have hp laptop or dell, which have a little larger market share – parts for those laptops are usually more readily available on the market and can be found quickly at few touches of the buttons. in case of this samsung np680z5e laptop it was not the case. I looked everywhere to find lcd cover and couldnt find anything. so then i called samsung parts company authorized by samsung and they told me lcd cover on its own was not available. I had to purchase the whole lcd assembly. it was over 450 dollars. which was probably close to what the laptop itself costs. so you do the math. 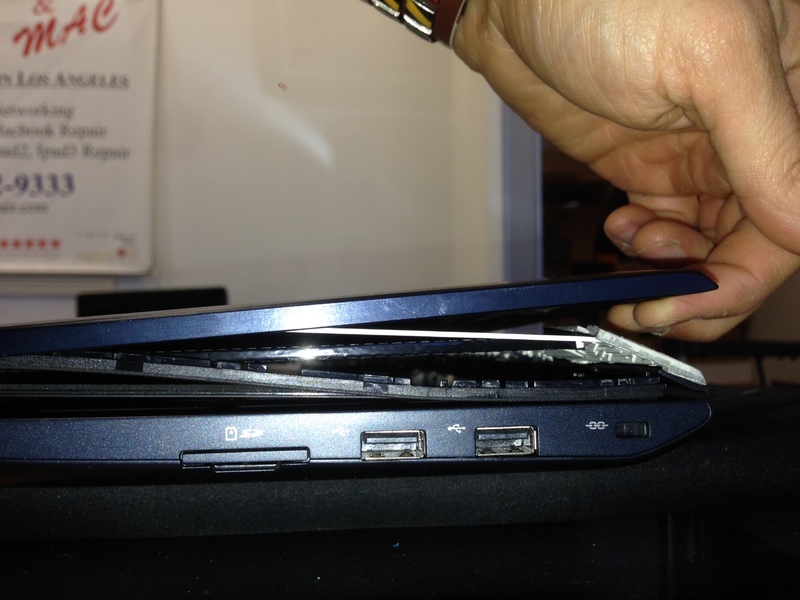 you want to buy a laptop that is not so popular you risk situations like these. you buy more popular laptops like hp, dell or asus you will have more parts available in case something goes wrong. for all laptop and desktop repair needs feel free to call us at 818-532-9333 or visit us at 22941 Ventura bl #G, woodland Hills, CA 91364 we are the best at what we do and we do it the quickest!! !